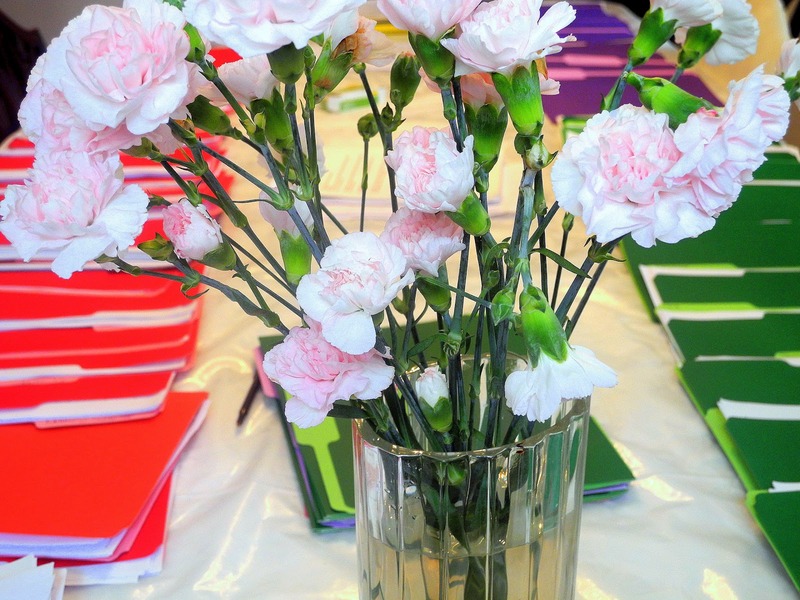 I love teaching and I also love the preparation. You should see my dining room table (I will take a photo). I am organized with my passion but it takes over the house. Although, it does not get too close to the kitchen, it keeps me out of the room. 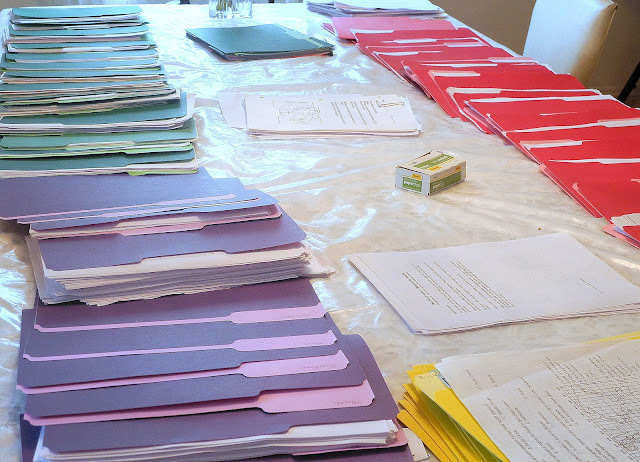 As I am on my way to cook up a dish, I see all my folders and start filing papers. That inspires me to get additional material and off I go to my papers or to the computer for new information. That, in turn, sends me to my books to do some more research on a teaching writing which rings a bell for a new bulletin board. I guess, prep work is prep work, whether it is cooking or teaching. Out comes the materials and then we mix and match to make the best "dish" for the meal (best lesson for the class). I teach like I cook. I can't be restrained. I follow my instincts and seem to know what will work for the particular situation. We do lesson plans for the week, like we might plan a weekly menu and my intentions are good for both. When it comes to teaching, my true goal, is to complete the skills but to do it, as it strikes me. Some would call that unprofessional. I call that inspired. I see what my class needs and go with it. Nothing is more important than the child. The goal is not to teach a subject but to teach the child. Teaching the child should result in that kid growing in the skills and mastering the material. I believe in the flexible-structured classroom. Sounds like a contradiction but it is not. In my opinion, flexibility only works within structure. My children know, clearly, what is expected of them and that as long as they come through, the day will be productive and pleasant. I look to cooking to be a positive experience for me and I look to teaching to be one for the class and also for me. If I don't enjoy it, I must leave. Only through a personal plus can I offer a class the best. Just like my kitchen is my laboratory, so is my classroom. Experimentation with food has produced good eating. Controlled experimentation has produced better learners. I hope, I am not scaring you as to the kind of teacher, I am. I think, I do a great job and have students who learn and are happy doing it. Happy means discipline with love. I approached this dish in the same way with excitement and determination. I started off, as I do with a new class, limited knowledge as to what they will be like at the beginning of the year, limited knowledge as what this new dish will be. I had made a pasta dish for dinner and needed a side to go with it. I had some frozen spinach, I wanted to use up. Since, I started using fresh spinach, the frozen doesn't get used, often. I also had too much Ricotta. I must have forgotten, I had already gotten some, because I found three containers. There is no way, I could use that up reasonably unless I started immediately. That gave me spinach and Ricotta. This dish, more than any, I have made developed as I went along. I had no idea what the next ingredient was going to be until I pulled it out and found a way to include it. This was such a delicious dish that I decided to do this again. Spray a 2 quart casserole or a square baking pan. Microwave spinach and drain well. Place spinach in a large bowl. Add dip, shredded potato, Ricotta, chopped onion, and eggs. Mix well. 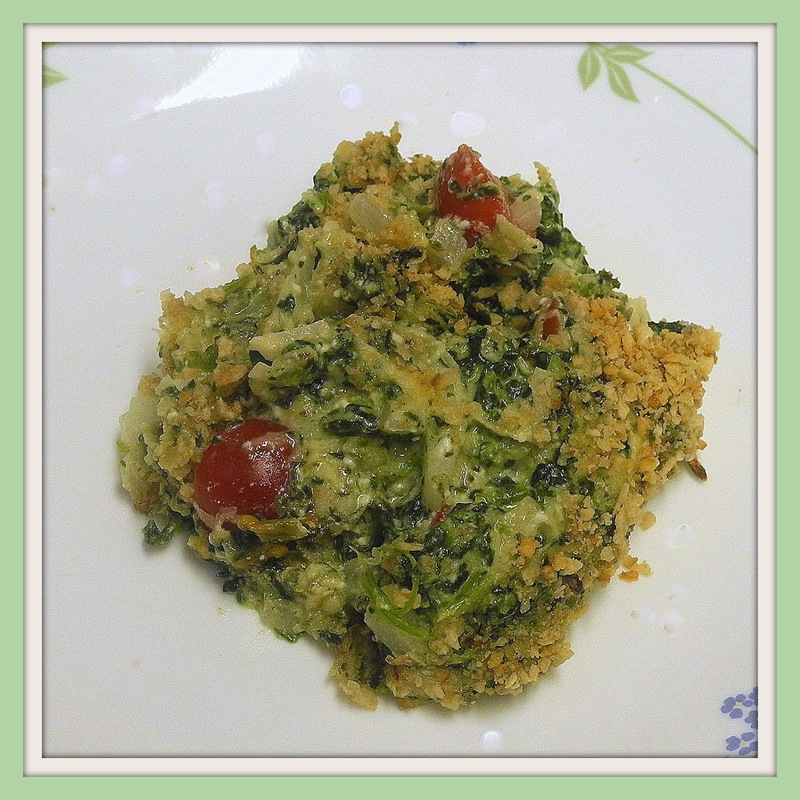 Add 1 cup crumbs to spinach mix with cut up tomatoes. Place in a greased casserole. Top with additional cup of crumbs. Place in 350 degree oven for 25 minutes. This looks like something I'd love! Thank you for sharing the recipe. Now I know what to do with that ricotta that I have in the frig and those tomatos on the countertop. I pray that as you begin the new school year, there is something each day to inspire you to keep making a difference in the life of our children! Have a great rest of the week! Look wonderful! Thanks for sharing on Southern Sundays! Have a great week! There's a lot of prep work posts lately - must be the season. I loved reading about how you approached this dish and how it ties in with your teaching methods. Thank you for sharing with See Ya In the Gumbo this week. I think I would rally like your spinach creation (I love spinach).